While I begin to pack up and prepare to move out to a new studio space, I am looking into some new studio lights. As you can imagine that the photo floods and umbrellas that I have been using for 3 years have reached the point of little use. Strangely I have become used to photographing myself with my cat Waffles that I need some lights that can be used with ease and stronger wattage. I have come across a new company called Alienbees, which has a strange approach to their marketing. They are utterly obsessed with aliens and bees to the point that their user manuals have alien bees on them. 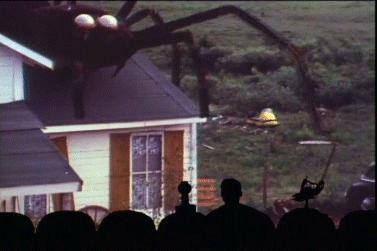 Sounds like a MST3K movie plot. This might be close enough. These lights are so strange that I simply must have them. A pair would work great including a new greenscreen background. Waffles and I might use it to visit some exotic locations. That being said I found a great photo the other day that I had forgotten about, a great display of American patriotism. 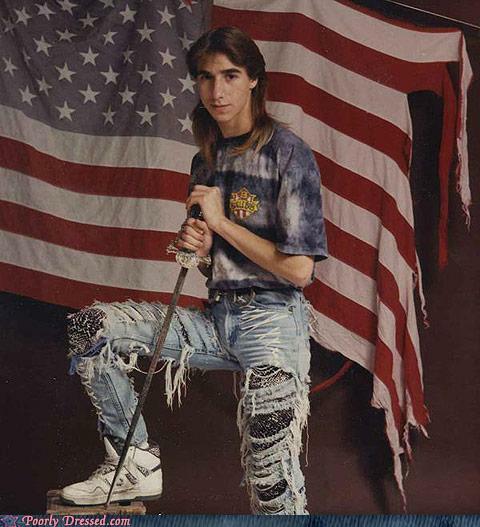 I would have done this photo myself had I liked torn jeans and an American flag. I guess a sword as well and some long hair. Where will my new studio be? That information is on its way soon.